This dialogue proposes that work and human flourishing is the signature faith in the public square issue of our time. Just as the search for racial justice and equality attracted diverse religious leaders to march alongside African American activists during the civil rights movement, religions are again summoned back to the public square. The present call is for Jews, Christians, Muslims, Hindus, and other sacred traditions, to think aloud theologically about the contemporary crisis of work. Present structural changes in the U.S. labor market, ushered in by economic, global and technological developments, point to lower thresholds of “full employment,” as more workers will be permanently un/underemployed or altogether disengaged from the workforce. The crisis of work in our day must be seen for its impact on both the material and non-material diminishment of who we are as persons and what we become as a society. Historian Patricia Ranft writes, “Work is intrinsically valuable because it gives humanity the power to transform self, society and nature” (America, Feb 18, 2013). Our dialogue begins with a historical discussion of work and religion, but it must not end there. For the conversation to be truly public it must also be interdisciplinary, bringing philosophers, historians, educators, psychologists, economists, and policy makers to the square as well. Situating the sphere of work in the realm of the meaning making and fulfillment that lies at the core of what it means to be human, this conversation seeks to reframe the present labor crisis as an economic and existential one; an impoverishment of both our technical vocation and our human vocation. This moral measure of work must examine the technical means of work (e.g. wages) and the human ends that extend beyond the technical and connect up with my experience of agency, creativity and purpose. Religions are uniquely suited to a non-reductionist value of human labor. And yet, the earliest insights to a moral economy of labor takes us back to Aristotle’s Nicomachean Ethics. Aristotle’s theory of eudaimonia (translated by scholars for centuries to mean “happiness,” but more recently, “to flourish”) draws the connection between happiness and the moral virtues. By distinguishing activities of “action” and “making,” Aristotle says our “making” is always external to us whereas our “actions” are their own ends. Aristotle’s ethics connects actions with our capacity to flourish, “For while making has an end other than itself, action cannot; for good action itself is its end” (NE 1140b, 6-7). If we apply Aristotle’s philosophy of labor to Genesis 1 and 2, we see might say that God “makes” the created order, but God “acts” on human life by virtue of creating it in His image. Thus, the created world is ordered to humanity and humanity ordered to God. Our capacity for flourishing becomes “disordered” whenever we confuse labor’s instrumental actions (production) with labor’s actions that are their own ends (purpose). An example of how we must continually correct for imbalances in work and human flourishing is the Jewish Law on the Year of the Jubilee (Lev. 25). The Law states that every fifty-years all workers are to be set free and the land returned to their original owners. This redistribution of money and power was designed to restore the original order of the created world, including the dignity of all persons and their capacity to flourish. Desert fathers and mothers of Christianity of the 4th century take the biblical foundations on work to new spiritual heights. These monastics understood a natural rhythm of work and prayer as compatible ways to entering the presence of God. Medieval historian, Patricia Ranft (see book review below) says Christian medieval theology provided the framework for modern debates on the concept of work, “Work in all its numerous forms and types is the means by which humanity maintains its relationship with the world, and, as such, work is the means by which humans fulfill their potential to become one with the sacred” (The Theology of Work, p. 71). Building on the biblical origins of human work in the late medieval period, Jewish mystics of 13th century Spain envisioned the creation of the world occurred by God contracting into himself, in order to make room for creation, but leaving behind fragments of divine light. Human work was nothing less than the restoring of these shards of God’s presence to the world. With hundreds of references to work in the Qur’an and the Hadith, the ethics of work is presented as both a human right and a responsibility. “Al-amal al – salifi” is the Arabic phrase that roughly translates, “To do good work.” Sharia prescribes the practices of good work to include paying a just wage and the redistribution of income through the charity requirement of Zakat. But Islamic law also touches on a theology of work in its stress on the freedom of the person who performs the work balanced by the idea that the person exercises this freedom not solely individualistically but also in accordance with the larger intentions of society. Islamic philosopher Seyyed Hossum Nasr explains that the word “work” translates to “artistry,” a creative act that allows us to imitate God in our humanness. Early modern debates on work in Christianity stress its social benefits but not to the neglect of its theological importance. 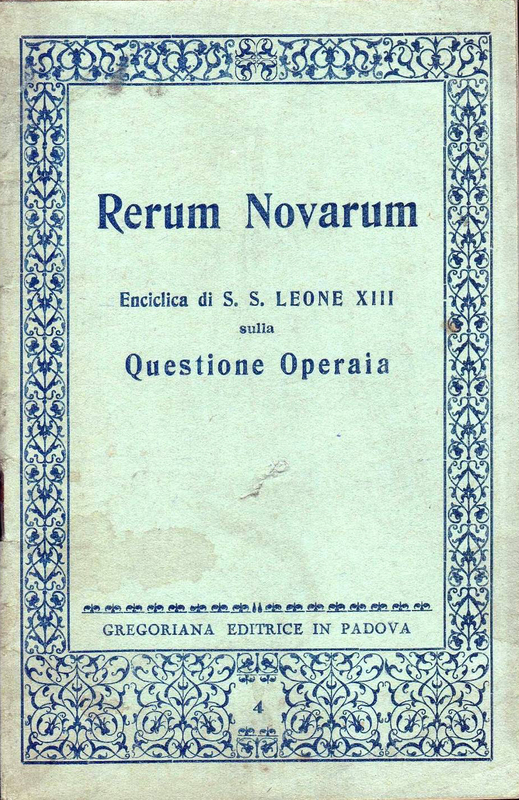 With the publication of Rerum novarum, Pope Leo XIII’s encyclical of 1891, the Roman church asserted the inherent dignity of the worker independent of his labor as the rationale for worker economic justice. Almost a century later in 1981, Laborem exercens of Pope John Paul II, presents work as source of human moral agency and transcendence, “Work is a good thing for man – a good thing for his humanity – because through work man not only transforms nature, adapting it to his own needs, but he also achieves fulfillment as a human being and indeed in a sense becomes more of a human being” (Laborem exercens, 9). More recent scholarship on a theology of work includes Work in the Spirit: Toward a Theology of Work (1991), Miroslav Volf’s acclaimed pneumatology of work as the cooperation of our human gifts with the Holy Spirit in the transformation of the world. Our dialogue is the search for a public theology of work that draws on the great theological and philosophical traditions in conversation with the findings of the social sciences on human flourishing and well being. Taken together, these ideas can serve as both a social critique of work that dehumanizes, and a social ideal for new conceptualizations of work that align development with human development, capital with human capital. Thank you. Your focus on work is extrememly timely. Especially liked characterization of “making” vs. “action” and Jewish mystical idea of work relating to “shards of light”. I affirm that this is a wonderful piece on an important topic. Thank you. How would you address more fully, on the one hand, the right to work as the right to participate in society? On the other hand, how would you address the reality that so many people over work, that is, people intentionally or are forced to spend so much time working that they lack balance in their lives?